If someone is hilarious and irreverent, they usually go to the top of my list--and that would describe Johnny Pigeau, owner of Backbeat Books & Music, in Perth Ontario, (6 Wilson Street W, Perth Ontario, K7H 2M5) a fabulous store that sells books, vinyl, CDs, DVDs and off-the-wall gifts. I so liked the way he formatted the interview that I left it alone. And I deeply appreciated his attempt at my math problem. Thanks, Johnny! YOU: You not only sell new and used books, but you also sell vintage vinyl (my husband has our entire basement filled with vinyl), DVDs, and funky gifts. I love this because I bet it means that people come in for a book and they might leave with a lamp shaped like a rocket ship, too. Any further plans for the store? ME: It’s quite true. People often come in looking for Alice Munro’s newest book, say, and leave with a stack Wham! records and a table lighter from the ‘70s that looks suspiciously like a grenade. Another customer was thrilled to walk out with a tiny Hohner children’s accordion and a Brunswick bowling pin. I believe his girlfriend bought a book. And nearly everyone wants to buy my U2 “Desire” poster, but, um, no, that’s not for sale. I’m addicted to thrift shops, flea markets and auction sales, so the shop is always filled with funky gifts. We mostly sell books and music and movies but sometimes that can get boring. You gotta amp it up sometimes. If you leave our shop without at least checking out our vintage Parakeet Training record (“Your parakeet can teach itself to talk!”), well, I’ll consider that a serious personal failure. YOU: You are an author, too, with a book coming out this January, THE NOTHING WALTZ. So that means I have a million questions for you. First, tell us about the book--which sounds great. How do you manage to write while running a store? What was it like writing the book and what's your daily writing life like? As far as process, do you plan things out or do you write and hope for the best? Are you already writing another book? I wrote the book before we opened the store, actually, and thankfully I had been awarded an Ontario Arts Council grant which gave me the time to write the book. Writing the book was a fun, exhilarating, nerve-racking, hair-pulling experience. Many moments of great creativity and breakthroughs and the joy that comes with molding a character that feels very real and complex and multidimensional, but there were also moments of pale white terror and feverish doubt and long brainstorming sessions/therapy at the pub when it felt the whole thing would never come together. But thankfully it did and lots of people seem to like it. I credit fairy dust, beer nights and my lovely wife, Erin, for keeping me sane throughout the process. I did plan the book. That is, I knew the basic story, but then it took turns of its own as the characters became more and more real to me, fleshing themselves out and leading the way, as it were. Writing a novel truly is an organic experience, I found. You get stuck, you curse, you nap, you throw out lots of paper balls. You wake up at 3 a.m. and everything is clear and the next thing you know the sun is rising and you’ve written 40 pages that, when you read them a bit later, are truly (and bizarrely) a pleasure to read. And I don’t mean that in a braggy way. It just happens: you surprise yourself. It’s like a mechanic at day’s end thinking: “Holy crap, I just took that car apart and reassembled it and now it’s purring like a kitten.” I often wish I was paid as much as mechanic. I’m currently working on my second novel; it’s called Speck (the main character’s name is Templeton Speck) and is due out in the Fall of 2013. Basically, it’s about a shopkeeper who one day realizes he’s living a second-rate sort of life. He’s nearing forty and he’s totally bummed out and baffled as to how to remedy his situation. Templeton’s single, childless, mortageless, perpetually broke, and essentially takes care of his messed up family: a once famous and now drunken father, a sweet, agoraphobic older sister, a rebellious hipster nephew, and a homeless step-mother. Really, it’s more cheerful than it sounds. To me, there is humour in most everything. And if you don’t find it, you’ll go batty. Templeton Speck agrees. It’s also one man’s spiritual journey; it’s not all all about owning a crappy car or living in a cramped apartment with leaky pipes or eking out a living. Finding your place on the planet is every bit as important, if not much more important, than how much money you earn. As is finding love, that one Big Love. And that’s something else Templeton comes to realize over the course of the novel. ME: Sure. For two years now, we’ve had a very successful reading series at the shop. It’s called the First Edition Reading Series and we’ve been privileged and honoured to play host to some incredibly talented authors, including some national bestselling authors—Steven Heighton, Tish Cohen, Catherine McKenzie, Terry Fallis, Alison Pick and Tanis Rideout (to name only a few)—and some of Canada’s finest poets, including Phil Hall, who won the 2011 Governor General’s Award (Canada’s version of a Pulitzer) for poetry. Margaret Atwood has agreed to read in Perth in 2013, so we’re looking at organizing a literary festival in Perth—unless she wants to read in our shop, with its 20-seat capacity. That would be super neato cool! No disasters to speak of except the night we brought in a local country musician and one person showed up. I felt so bad I took the guy (the musician) to the tavern on the corner for drinks. Haven’t seen him since. Hope he’s okay. YOU: What three books and three albums are you pressing into everyone's hands these days and why? ME: We’ve been selling Beatles’ albums like crazy since they’ve been remastered and reissued on 180 gram vinyl. Jack White’s album Blunderbuss has been the biggest seller all year, and we’ve also sold quite a few Tom Waits’ records lately. People love them some Tom Waits. Great singer-songwriters—Leonard Cohen, Joni Mitchell, Dylan, Springsteen—seem to sell best around Perth because there are so many musicians here, I think, and people who just love quality music. As for books, lots of people are picking up Tanis Rideout’s Above All Things, a gorgeous, lyrical first novel that weaves George Mallory’s ill-fated 1924 quest to be the first man to conquer Mount Everest with that of a single day in the life of his wife, Ruth, as she waits at home in England for news of his return. The book will be released in the States in February, I believe; trust me, you’ll be hearing lots about it quite soon! Katherine Monk’s Joni: The Creative Odyssey of Joni Mitchell, an illuminating, in-depth portrait of Mitchell’s life so far, has also been selling well. She’s a fascinating artist and it’s a well-written book. A third book doesn’t immediately come to mind but zombies do—anything about zombies is a popular choice right now. Perhaps not coincidentally, Margaret Atwood’s next book is about zombies. Now that will be interesting! YOU: What's obsessing you now and why? YOU: And finally, if a train going 60 miles an hour is heading west and another train going 3.5 miles an hour is heading southwest, at what angle will the two trains meet? ME: Don’t trains go a lost faster than 60 miles an hour? They certainly boogie around here. I like riding the train. See lots of pretty girls on the train. Also, peeing while standing and not soiling yourself in one of those tiny washrooms in a speeding train is quite a feat! Proud to say I’ve accomplished that numerous times. At all sorts of angles. 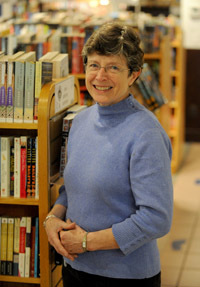 Carol Spurling at BookPeople of Moscow is just fantastic. I loved talking with her because she's so genuinely interested in books and people and her stories are just wonderful. Thank you, thank you, Carol! And watch out for their new website launching this week: www.bookpeopleofmoscow.com. BookPeople is in transition and under new management. Tell us about that, please. BookPeople was started in 1973 and has been downtown ever since. Last year the longtime owner (the second) decided to retire and there was about a year of doubt about the future of the store. But there were a lot of us that didn't want to live in a town without an indie bookstore, and a few very special people who did a lot of groundwork helped pair me (and my husband Walt) with another couple (Steffen and Nicole Werner) as business partners and together we have been able to keep BookPeople going and make it even better than it was before. We, the third set of owners, took over on January 1 and remodeled, restocked, and restaffed the store, and reopened on February 22, 2012. The community has been 100% behind us from the beginning. This is an exciting time to be in the indie book business. Things are going our way. BTW our new website will launch later this week, at www.bookpeopleofmoscow.com. First of all, the people are wonderful; really engaged and aware. We couldn't ask for better customers. As for the town itself: a middle-sized family-friendly community with a university in town, and another university only 8 miles away, gives us all the best qualities of a small town (tight-knit community, safety, no traffic problems, walkable, access to outdoor recreation, good schools) combined with all the advantages the university brings (arts and culture, young people, vibrant downtown food and drink scene, educated population, activists, artists, and organizers, farmers market, food co-op, etc.). I love the mix of rural and farm folk who have been here all their lives, faculty and staff of all ages and backgrounds, and the constant new arrivals who bring new ideas and energy. Our downtown and overall quality of life just keeps getting better and better. And, having previously worked in a bookstore where the busy season was during the summer tourist rush (Old Harbor Books in Sitka, Alaska), I am really grateful to be in a community where the dead of summer is the slowest season and things pick up again in September. It just seems more natural that way. I love the rhythm of a busy school year fall, winter, and spring, contrasted with a lazy summer. I love your Top Seven List on your webpage. How did that come to be and can you talk a bit about it, please? I wrote that pretty quickly on a Sunday night recently as I was thinking about the upcoming holiday season and all the things I wanted our customers to know - and all the things I wanted to make sure I had a handle on. Preparing publicity serves the double purpose of focusing my attention and helping me stay organized. People are pretty annoyed by constant emails from MailChimp in their inboxes, and I don't have time to produce fancy marketing stuff for every little thing, so I decided to take care of a lot of news all at once and just send them this one series of paragraphs, without any photos or color at all. I'm trying to figure out what gets people to open marketing emails and thought a title more catchy than "Latest News" would help. I always ask about author events! What makes a great one, and are there any mishaps that authors should know about? We have been lucky to work so closely with the University of Idaho MFA program and English Department who bring in visiting writers (and provide a large audience of up and coming writers who hang on their idols' every word), and some of our local writers have had book launches this year and were happy to let us host their launch parties. Beer and wine and good snacks help make a great event, along with a reliable sound system and. We're becoming famous for our Fender amp; I hope that when we get a real set of speakers that folks won't be too disappointed not to be using the Fender. Writers who are also funny result in great events. Jess Walter and Steve Almond had 'em rolling in the aisles, of course. But you'd be surprised at who has stand-up comic potential - especially if they write books that are not at all funny. Kim Barnes, for instance, is a hoot. So is Anthony Doerr. And Willis Barnstone, who is elderly now, and probably the most intelligent, learned man I ever met! Alternatively, a writer might not be funny, but if they can read compellingly, the audience will be eating out of their hands. So far we haven't had any big mishaps but I've had a couple of close calls with getting the books on time. That's a bookseller issue and not an author issue. All I ask is that they show up on time, remember their glasses and their marked up reading manuscript, and wait to go to the bar until afterwards. So far, so good. What three books are you pressing into everyone's hands these days--and why? Only three??? Well, I'm going to be biased towards our local and regional authors who write world-class literature: Kingdom of Men by Kim Barnes, Beautiful Ruins by Jess Walter, and The Revised Fundamentals of Caregiving by Jonathan Evison. Also Blasphemy by Sherman Alexie. Why? First of all, I've gotten to know these writers just a bit and having the tiniest bit of insight and connection to the author makes selling the book a lot easier. The books sell themselves on their own merits - skillful storytelling, addictive plots, memorable characters, relevant themes, plus a little something magical you can't identify - but for me to be able to add something personal makes all the difference. I really can't stop with three or four: Anything Worth Doing by Jo Deurbrouck is a true Western river-rafting adventure story that people in our neck of the woods are talking about. It is also so exciting to have a new Timothy Egan book out too, Short Nights of the Shadow Catcher, which is about the photographer Edward Curtis. I've lived out West for more than half of my life, but as someone who grew up in the Midwest, I am still learning about what makes this part of the country and its people so intriguing, and sometimes, so inscrutable. Writers who share my love for the West always help me understand my adopted part of the world a little better. I think one of the most wonderful things about indie stores is that the sense of community. You get to know your customers and can often anticipate what someone might want to read. Plus, your store becomes a destination. When people ask for recommendations, do you give them what they want all the time, or do you ever stretch the boundaries and suggest something that might broaden their reading horizons? I find that when people ask seriously for recommendations, they don't know what they want at all, aside from certain qualities, for example, fiction or non-fiction or "not too much violence," so, within those parameters, I always just recommend books that I love or that my staff has loved or that is a classic or solid backlist seller they haven't yet experienced. And they're usually thrilled with what we suggest. You can tell if they don't really want a recommendation because they will keep finding reasons to reject your suggestions. I don't know if what I love will stretch other people's reading horizons - I've had staff with much more adventurous tastes than mine - but I just want them to experience something great. I had a customer recently that I directed to Kurt Vonnegut. So he read his first Kurt Vonnegut and came back in right away looking for more. Kids that haven't yet heard of Arthur Ransome's Swallows and Amazons...I get such a kick out of introducing them to an entirely new world. I just got to turn a cozy mystery reader on to Jacqueline Winspear and Laurie King. One of my staff who loves to cook hadn't yet read any M.F.K. Fisher. Anything new to you, that grabs you, is broadening your horizons...that's what I love about this profession. Enlightenment and inspiration happen in our store every single day. Aside from the first-year learning curve of owning a bookstore and all that comes with that I tend to be pretty balanced. I've been obsessed for 20 years with France and French food and culture and that does tend to show up in a few areas of the store like cookbooks and travel and mysteries, and the French conversation group that meets in the store once a week. But I'm starting to feel a niggling interest in Scandinavian and Icelandic culture too, so perhaps my France obsession is fading? I'm obsessed with keeping the store clean and organized. I'm obsessed in the very best way with my new favorite mystery series, Maisie Dobbs, and my old favorites, Inspector Guido Brunetti and Bruno, Chief of Police. And, I've been waiting for the new Downtown Abbey series and the new set of Sherlock Holmes (with Benedict Cumberbatch) from the BBC for what seems like forever. And I've been dreaming about building a house off the grid lately, but I need to keep from obsessing about that too much, until the five years of work we still have to do on our existing house is done. We will gladly mail books to customers anywhere in the world and we would love to be a destination book store so please consider a visit and we love it when people from big cities come into the store and tell us that BookPeople is the best book store they have every been in. 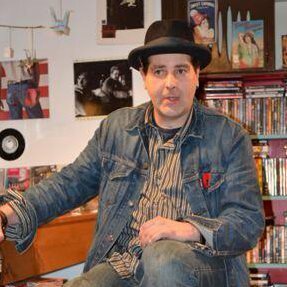 Chris Livingston owns the amazing The Book Shelf (162 West 2nd Street, Winona, MN. (507) 474-1880). The store does all kinds of wonderful things, including a Dinner With The Author evening planned with Julia Pandi for Memoir of Sunday Brunch--which seems like a wonderful, delicious way to interact with an author. I'm thrilled and honored to have Chris here. Thank you, Chris! How do you see the bookstore changing in the next few years? My staff and I regularly try to change things up with respect to author events. We even, on occasion, host an "author-less" event. If we can come up with interesting ways to present books and authors to our customers, we will pursue it. We host the more traditional "reading and autographing," but we take advantage of the great restaurant we share space with to host meal events with authors as often as possible (although, in some cases, patrons are coming for the food as much as for the author). We have found that events work best here in our community if we can partner with other organizations. Example, if we are considering hosting an event for a health-related book, we might partner with the local clinic, physician, acupuncturist, YMCA, etc. We list them as the sponsor, and only ask that they help us promote the event. These partnerships have become critical to not only successful events, but in continuing to allow us to "infiltrate" the community as a whole. Winona is an interesting city. Two universities and a large technical college are located here, along with several thriving manufacturing industries. It is located in the southeast corner of Minnesota, along the banks of the Mississippi River in the beautiful bluff country. 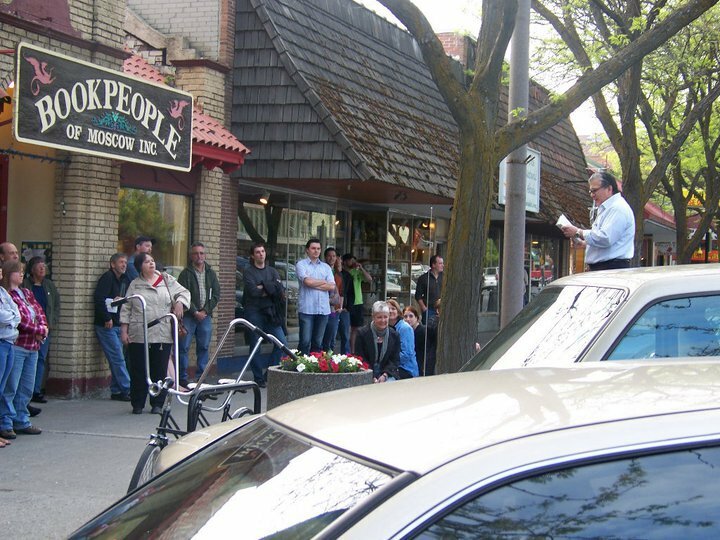 Winona is also an arts-tourism based city, playing host to The Great River Shakespeare Festival, Minnesota Beethoven Festival, Midwest Music Fest, and the Frozen River Film Festival. The combination of intellectual and arts/culture interests in the community play right into a bookstore's target demographic. Our store continues to evolve. We continue to diversify our revenue streams in order to ensure steady cash flow. We have published our own book, now in its third printing. We continue to reach out to corporate accounts. We travel throughout the state with travelling book fairs for conferences. All of this is necessary just to keep the lights on and books on the shelves. We have added Kobo e-readers to our lineup and now offer over 3 million e-books through our website. Physically, we plan to expand our children's section (for the third time), as it continues to be the best performing area of our store. We have already added new toy and game lines, as well as a 30% increase in stocked book titles. It seems we are always looking to modify and improve on what we are doing, even if some changes don't always bear fruit. What three books are you insisting everyone read these days? Only three? From what seems like a never ending list of great books this season, I will give you one novel, one picture book, and a piece of nonfiction. Fiction: "The Revised Fundamentals of Caregiving," by Jonathan Evison, because not only is it a great, well written novel, but because we all need to root for a loser on occasion. My picture book for the season is "Nightsong," by Ari Berk and illustrated by Loren Long. It is such an endearing story of a young bat who is a bit scared of taking his first flight by himself out of the cave, and is encouraged by his mother to use his "good sense," both literally and figuratively. The book's illustrator, Loren Long, is my current favorite. Just a beautiful story with phenomenal illustrations. From the nonfiction side of things, don't miss Susannah Cahalan's "Brain on Fire." Cahalan explores her dramatic descent into madness and live-saving diagnosis that almost came too late. Her narrative is fast paced and sharp, and will grab you right out of the gate. Riveting. Well, in the end, I am a salesman. If someone walks into my store, and asks for a specific book, that is what I deliver. However, the best part of my day is when I get to help a customer navigate the thousands of titles on my shelves in order to walk out with something that will bring them back in next week asking, "I need something JUST LIKE THAT." My answer is, inevitably, "There isn't anything just like that, but I can help you find the NEXT great book you will love." I am always amazed on how much my customers trust my judgement, and I am sure my case is not an isolated one. It happens at independent bookstores all over the country. We truly love books, and our passion for the books we love is what has launched the careers of countless authors. I am in love with David Mitchell and David Rhodes, Louise Erdrich and Hillary Jordan, John Steinbeck and Charles Dickens. I will sell a copy of Fifty Shades, but try to put a copy of "The Time Traveler's Wife" into their bag as well. I read Mary Oliver poems out loud in the middle of the store, and then walk interested parties over to Minnesota's own Joyce Sutphen. David Foster Wallace is my hero, but then again so is David Sedaris. Damn. I really love my job, don't I? The Hobbit. It is, in fact, the book I've read the most times in my life (upwards of a dozen, I think). I'm reading it now to my children, and am working through the new book "The Hobbit and Philosophy." The prospect of the first film's release next month has me feeling like a kid on Christmas Eve again. Oh....and by the way, I am handselling the book this season to everyone. If you've read it, you need to read it again before seeing the movie. And if you haven't read it.....well, I have a solution for that. Oh, and then come back and talk to me about it, so I can get all excited again. I was trolling through Facebook one day, when I saw a painting as writer Robyn Wright's profile picture. It was of a woman walking through the snow and the painting did something to me. It got into my bones and I became obsessed with finding out more about the artist and her work. I quickly friended Robyn and she asked the artist, Sheep Jones, if she'd consider being interviewed, and I'm thrilled Sheep said yes. Sheep studied at the University of Maine at Portland/Gorham. 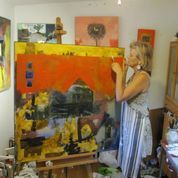 She works in oils and wax, and her paintings have been shown in both solo and group shows along the East Coast and in Eastern Europe. Thank you so much, Sheep for letting me pester you with questions. How did you first become an artist? Growing up in a large Catholic family in Maine, we were exposed to music, but not art. There wasn’t much of an arts program in the Catholic girl’s school I attended from kindergarten through High School. When it came time to consider college, my parents and I compromised. They insisted on Art Education rather than Fine Art, as a more likely source of a job in the future. I have to ask, where did you get the great name, Sheep? I met Charlie (my husband) in High School. I had long hair and unruly bangs that were always in my face. When Charlie’s father noticed us hanging out together, he said, within earshot of a few of Charlie’s friends, “Who’s that Sheep Dog you’ve been hanging around with?” The name just stuck. What's your daily working life like? My job is painting. I work at the Torpedo Factory in Alexandria, VA. This building is open to the public every day. It has 3 floors, filled with artists who work and exhibit their art in separate studios. 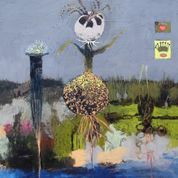 I am also represented in numerous galleries that feature me in shows. They also maintain bodies of my work. Being visual and able to retain images for later use, I gather separate stills from movies, books, dreams, and stories. I also take photos of isolated shacks on my drives through the Maine landscape. I am always searching for the narrative in my paintings. When it starts to emerge I know I am almost finished. Can you talk a bit about your world view and how it's incorporated in your paintings? When I add a set of incongruous elements to a painting, it opens up a richer, more mysterious narrative than the straightforward storytelling you would find in a more traditional painting. Using images from life, my memory, and my imagination gives me a vast source of these elements, keeping the results slightly out of balance, which I find satisfying and exciting. My latest figures are clad in versions of 17th century fashions. Perusing the internet, finding mny gems, has been my latest interest. Has monocular vision affected my art? At the age of three, I lost the vision of my left eye. My sense of depth perception is compromised, and my paintings tend to have a flattened perspective. The divine Meg Pokrass interviews quilter Joe Cunningham. Thank you, thank you, Meg and Joe! 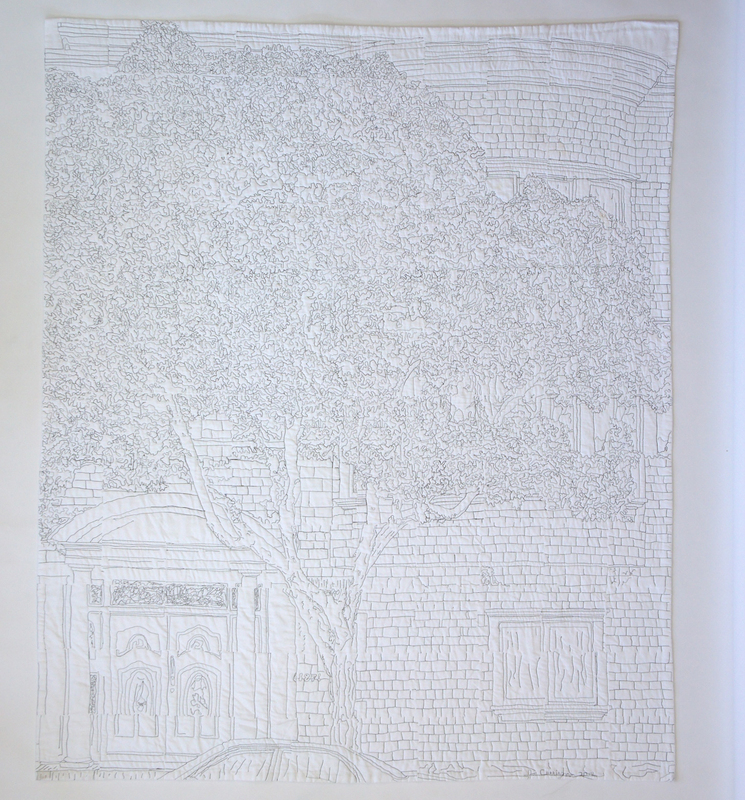 Joe Cunningham has been a professional quilt artist since 1979. He has written essays on the subject for museum catalogues, books and magazines. His book, “Men and the Art of Quiltmaking”was the first book on its subject. 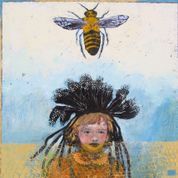 In 2004 he received a $30,000 Shulte Grant from the FortMason Foundation. In 2009 he received a grant to study with the Gees Bend quilters in Alabama. In 2010 he was artist in residence at the De Young Museum in San Francisco, which purchased one of his quilts for its permanent collection. Joe travels throughout the country to give lectures and workshops on quilt making. His eight books on quilt making include the first biography of a living quilter and a definitive book on marking quilts for quilting called “Quilting with Style,” published by AQS. How did you become a quilter? What age? How did this art form find you, or you it? I was born in 1952 in Flint, Michigan, and grew up in a small farm town nearby, where most of my friends were the children of factory workers. Growing up, all I ever cared about was music, books and art. I would skip school to go to the art institute. I would read books of art criticism by intellectuals who wrote well over my head, hoping that some day I would magically understand what the hell I was reading. Biographies of artists fascinated me. None of my friends went to college. Instead, we all headed off into various self-made occupations. I had started playing guitar in nightclubs around town when I was 15 years old, so with that and working various day jobs, from hod carrier to dishwasher, cook to bus washer, I made my living. I made friends with all the artists in my hometown, and sought any kind of connection to the art world I could manufacture. The thought never occurred to me that I could make art myself. I was not much talented at drawing. I was not much talented at writing or acting. I could play guitar pretty well, however, and I managed to parlay my modest abilities into a modest career as a musician from the time I was 15 to the time I discovered quilts when I was 27. I played any number of small bars, wedding receptions and after-hours joints, five or six nights a week. I even wrote a one-man musical about a hobo in the 1930's that got me a job teaching guitar at Colorado Northwestern Community College. There my teaching salary covered my tuition and books. I thought I wanted to be a writer, so I studied nothing but English. I took 24 credit hours of mostly independent study in my second semester, since I had taken all the available creative writing and literature courses in the first semester. I liked it so much that I thought maybe I should become an English teacher. But then the next summer I ran into a box of quilts that changed my life forever. The first time I saw these real quilts, in 1979, I found them dazzling, and tantalizing. Where art had always seemed distant and for someone else to create, the first thing that went through my mind was, "I could do this!" My mother made quilts, so I had seen them growing up; I had in fact slept under her tied comforters since I was little. Surely if my mother could make one of these I could. First, however, the collector offered me the chance to write a catalogue about these quilts. I was interested in them, I wanted to be a writer and here was a writing project. In order to write about the quilts I had to learn quilt history. Fine. If I was not going to return to college, I thought, I should at least give myself a college education in quilts. My mentors were Mary Schafer and Gwen Marston. Mary was born in Hungary in 1910, emigrated to the US in 1915 and lost her mother in the influenza pandemic of 1918. To make her a desirable marriage prospect, her dad sent Mary around to the neighborhood European ladies to learn the various needlework skills she would need. Eventually she married and had a son, then took up quilting in 1948. By the time I met her in 1979 Mary had won every possible blue ribbon in the state and had stopped entering competitions so her friends could have a chance. Between Mary and Gwen, a younger expert quilter, I learned that to be the sort of quilter they respected I had to read all the literature so as to be familiar with the history of quilts and quilt fabric. Knowing the regional and ethnic styles would help me know how old a quilt was and where it may have been made. I had to become an engineer and designer of quilts and quilt patterns. I had to master all the techniques involved in making a quilt so as to be able to copy old quilts and absorb their lessons. All in all it was a sort of apprenticeship along classical lines. It agreed with me. I loved the sewing and the study. Eventually, Gwen and I teamed up to make quilts together and ended up writing books and magazine articles about quilts, making videos and traveling all over the country to teach. We worked together for 12 years. Altogether I think that my subconscious desire to be an artist, together with my idea that anyone could make a quilt, made becoming a quilter seem like a logical and desirable thing. What is it like to be a male in a female-predominant art form? Well, I understand that when a woman goes into a realm traditionally considered male, men will often do anything they can to keep the woman down, to shut her out, to marginalize her. In my case it has been the opposite of that. When I went into quilts I was a 26 year old tall white boy who felt comfortable around older women. Those older women responded by treating me like a most honored guest, and very quickly began treating me like an authority, an expert...instead of marginalized I got centralized. This continues more than 30 years later. But there are psychic aspects of quilt making I will never apprehend, whether it is from being a man or from being wired a certain way. For me, quilts have always represented an art project. For many quilters it is the community of women that is most important, and the actual quilts less so. The quilts are gifts to be given either to loved ones and friends or to charitable organizations to be dispersed. So I am a foreigner in this quilt world, psychically and physically. After a while, the subject of my gender becomes uninteresting in the quilt world. But it is a daily freakout to every single person who learns that I am a quilter. It is like my wife, to whom people used to exclaim, "But, you don't LOOK Jewish." But, I don't LOOK like a quilter. That just goes with the territory, and if I didn't enjoy the attention and the very freakiness of it, I would tell people I was a janitor, or a bookkeeper. What is the hardest thing about being a male quilter? What is the best thing about being a male quilter? This is actually two questions, now isn't it? The hardest part is communicating the fact that I have dedicated my life to this thing, that I am struggling as hard as I can to do something original and serious. The very idea of a quilt seems to ward off serious thought and intention. The best thing is that over the years I have come to know some of the most brilliant people in the quilt world, true scholars and wonderful human beings I almost certainly would never have had the chance to meet and share it all with if I were in another field. What are some of the most exciting moments you have experienced in your career? It is monumentally exciting to hold a copy of your first published book. Even though my first book was a simple Dover pattern book, I will never forget seeing my name on the cover the first time...the first time I sold a quilt to a museum for thousands of dollars...the first time I went to Gees Bend in Alabama and met--and quilted with--the women I had read so much about, whose quilts I had studied, was a great thrill. The best part of that trip was the very quilting itself, for this reason: my whole project from the beginning has been to apprehend how women of the 19th century thought and felt about quilt making, how they arrived at the the state of personal freedom that allowed them such unfettered creativity. In Gees Bend I was able to quilt with women who really had learned from their female relatives and forebears in a direct line back to the 19th century. Even though nothing of the mental state, the emotional or cultural condition could be articulated, I was able to just enjoy the immersion in the moment of working together and to enjoy the state--against all odds--of being, for a moment, a peer, just one of the people around the quilt frame. Of course that feeling vanished when the women started singing hymns in spontaneous harmony. Never have I felt more unnecessary or extraneous. The women had been singing together since the cradle. The beauty and, once again, the spontaneous creativity of it all, could only be insulted by my croaking along in a lower register. But that only emphasized all the more how lucky I was to be able to participate in the quilting as a peer, an equal. Where to you ideas for design spring from. Do they find you, or do you find them? My ideas come largely from my questions about quilts and art that I want to explore. Can I make a quilt that uses some of the Ab Ex ideas I like? Can I do the quilt I am most afraid of? What happens if I just cut this fabric in half and sew something else to it? What if I did this over and over? Could I make a modern version of an 18th century idea? etc. Do you mentor? Have you had mentors? I have had mentors. First there was Mary Schafer, who taught me her philosophy of quilting, as well as lots of technical information. Then there was Gwen Marston, Mary’s pupil and my partner, who initiated me into the world of quilts by showing me Mary’s and talking about quilts in a brilliant and fascinating way. Over the years, I have learned much from older women I met around the quilt frame. Birdie Rutherford taught me how to handle and thread needles better than I ever could before. Mary Hostetler taught me how to quilt in a circle. 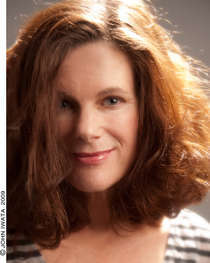 Lucy Mingo taught me how to think about the commercial and non commercial aspects of what I was doing. Julie Silber has been my mentor and friend since I met her in 1980 or so, constantly helping me to think about quilt history and the meaning of what we are doing in this crazy world. Randy French taught me how to see design in everyday objects, as well as the history of furniture, and indeed most everything I know about industrial design. I have been a mentor to a couple of people, one who came to me and asked me to be her mentor and one young guy I met when I wrote a book about male quilters. Deborah now lives in Mt Shasta and makes great quilts. Luke spent some time here in San Francisco and used to come by my studio and ask questions all the time. 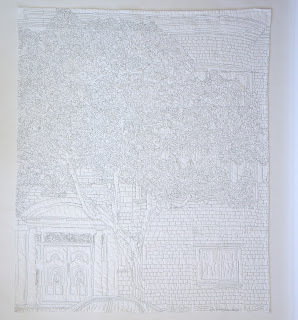 Now he lives in Seattle and has had many shows of his work in galleries and museums, and he still calls and confers on quilt things. William Wiley has been my friend and inspiration since I met him 10 or 12 years ago. Even though we have not spent a great deal of time together, every time we meet I am reminded of what I want to do, how I want to live, how I can be in the world. Also, my late friend Pierre Cabrol, an architect from France who lived in LA for many years, and who did high-level work and who knew how to enjoy life. Pierre had the knack (like several of the European men I have known over the years) of making you feel like the most interesting person in the room...reminded me somewhat of Marcel Proust in the way he wanted to know everyone from the maid to the princess, from the doorman--like I was when he met me--to the CEO. A lover of fine food and wine, music and art, plants and animals and people, Pierre seemed to wake up happy to be alive every day of his life. He became my friend and mentor, with whom I had many wonderful times and memorable meals and conversations. He was the model of the idea of the cultural life. Nicola Rooney of Ann Arbor's Nicola's Books talks about favorite books, building community and so much more! I bumped around a lot in college, transferring three times, once for a failed love affair, and the next time because I wanted to be in Ann Arbor. I went to Brandeis for two years, then decided that a small college was not for me (there was something about coming down to breakfast and having all 2,000 of the students know what I had down the night before and with whom that got me). I had a friend in Ann Arbor and went to visit and the day I did, I had the same visceral reaction I would later have years later when I finally moved to Manhattan. I knew I belonged. I graduated from the University of Michigan and I stayed there for a few years. Ann Arbor's a culturally enriched community and when i was there, it was filled with bookstores. It still is, and one of the best is Nicola's Books. I'm honored to have Nicola Rooney, the owner, here, talking to me! Thank you! And visit Nicola's Books online or in person at 2513 Jackson Avenue, Ann Arbor. (734) 662-0600. Tell me about all the changes that have happened in Ann Arbor in terms of books! In book terms, the closure of Shaman Drum, and then the bankruptcy of Borders, combined with Barnes & Noble's apparent strategic decision to concentrate on electronic rather than paper books leaves Nicola's Books as the only bookstore in Ann Arbor carrying the full range of genres. My thought is that the lack of bricks & mortar stores in Ann Arbor, particularly downtown, has driven many people into the clutches of Internet bookselling. Buying your books on the web is convenient, but it inevitably leads to a narrowing of the types of books you read. You tend to search for what you know about. It is hard to find a book or an author that you didn't even know existed, whereas in a bookstore your eye can be caught by a display, or a bookseller can introduce you to a book you had never heard of. A few years ago, the major source quoted by readers for where they got their book recommendations was the bookstore. Now the major source is word of mouth from friends, most of whom are suggesting backlist titles that they have read and liked. Social media and other web based sources are growing slowly, but are still a small part (about 12%) of the total picture. What is missing is the source of information about front list - newly published books, which is where a good bookstore excels. This ought to have the publishers worried - how are new titles going to be publicized and promoted if bookstores are not there to perform that function? We have seen a significant increase in business since the closure of the three Borders superstores in Ann Arbor, but by only a small fraction of the total volume that Borders was selling. Where have those book buyers gone? On-line, or do they not buy books at all any more? Our store has expanded sections such as poetry and literary fiction as a direct consequence of the closure of Shaman Drum. Our magazine selection has grown in response to requests from customers. We continue to expand our Children's Department, to keep up with customer preferences, but non-fiction other than Biography and History are still declining. Our inventory is sales driven - if books continue to sell, we continue to stock them. We bring in a wide variety of titles, but half the books we sell in a given year sell only one copy, so we keep our inventory wide in order to offer variety to our customers, and we operate a reordering system that aims to maximize the chance that the title you want is actually on the shelf. We do still special order titles that we have not got in stock, and many of them arrive within 2 days, so we can get the more obscure or older titles that our customers may request. Your store is such an integral part of the community. Can you talk about that, please? We have always tried to support schools with fundraising through book fairs, both in the store, and by taking books out to the schools for parents and students to buy. We have taken many authors in to schools when they are on tour promoting a new book - our ideal author visits one school in the morning, one in the afternoon, and then comes to an evening event at the store to achieve the best coverage for publicity and sales opportunities while they are in town. 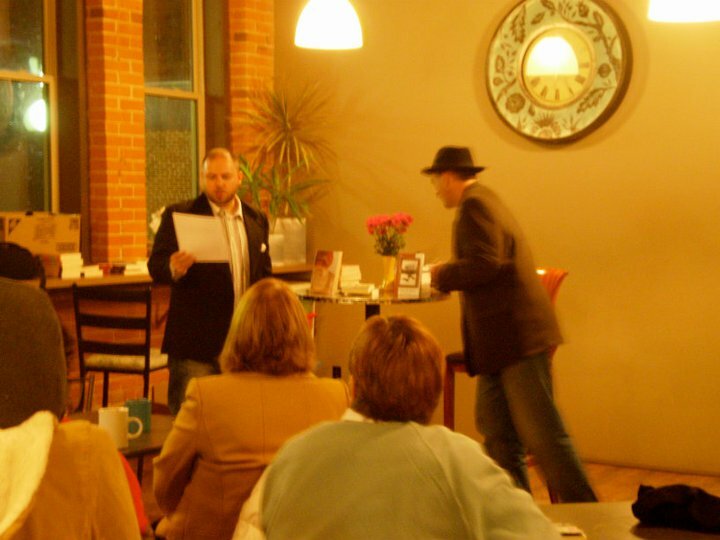 We bring books to events at the Libraries in Ann Arbor and surrounding towns, and to author events sponsored by other organizations of all kinds. In some cases, we have been collaborating with annual events for many years. We have been active in supporting both the Kerrytown Bookfest, held every September since 2002, and the Ann Arbor Book Festival, which is currently reinventing itself. I served on the Board of Washtenaw Literacy, a local adult literacy non-profit, for 10 years and we still fundraise for them by matching the value of donations of customer loyalty coupons, and by offering a percentage of sales to them if a customer requests it. We hold regular information sessions for potential tutors in the store, and we sponsor their annual fundraising auction. Our store is also the meeting place for writers groups, for book clubs and Master Gardeners lectures. Getting more bookstores into a community is not easy. Readers have grown so comfortable with buying on line, or downloading into their devices that they have neglected to realize that a bookstore has to turn a profit to continue to exist. Bookstores are not libraries. Bookstores are not supported by local taxes. Bookstores offer employment to local people, and hopefully generate a return on investment to the owner. Staring a bookstore is a major investment, and a risky one. 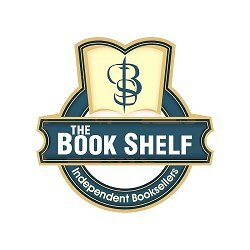 Until readers accept that if they want to have a wide range of authors to choose from, and a guide through the increasingly cluttered world of self published books, then they have a responsibility to take their book business to the place that provides those services - a bricks and mortar bookstore. On-line sellers give nothing back to the community, they don't care about your personal book preferences and they cannot provide the same joy of discovery that is easily achievable in a bookstore. If book buyers do not value the features that a bookstore offers, then bookstores will continue to decline - that's free market economics in action. Every author I know always wants to know, how can we do our part to have the best author event ever? Our preference is to minimize the reading part, and maximize the conversation part. Few authors are accomplished readers in our experience. Leaving time for in depth Q&A is important for us, and we think that our audiences appreciate that part of the event. Having more than one author at an event can be tricky, unless the two authors know each other well, or are at least similar in stature. It can be uncomfortable if your authors are not well balanced, if one is clearly more compelling to the audience than the other; then it needs a sensitive moderator to keep things under control. Discussing the process of creating a book, from the actual writing to the difficulties of getting a manuscript accepted, seem to be of interest to many audiences at our events. Which three books are you currently pressing into everyone's hands? I tend to read fiction, and I read many books that are good plain vanilla stories, no surprises, no rough patches, nice comfortable good reads that don't jolt or disturb your view of things. The ones I really like are the ones that do not follow the predictable path, the ones that I go back and re-read - sometimes many times. My old favorites include Shadow of the Wind by Carlos Ruiz Zafon, and The Piano Tuner by Daniel Mason, both intriguing stories paired with masterly use of words and definitely not predictable. My all time favorite is Dorothy Dunnett's Lymond series, but I think I've sold that to all my customers who might like it! The Art Forger by Shapiro - a novel examining the art world, and asking questions about the definition of great art, both modern and historical; authenticity, is forgery ever justified? are the best forgers the ones who have not yet been outed, when does duplicity spill over into criminality? It's an unusual combination of a good entertaining read, combined with the posing of some questions worth pausing to examine with some care. Garden of Evening Mists by Eng. Set in Malaysia after the end of WWII, when unrest and guerilla activity was still fairly common, the book perfectly evokes the spirit of an oriental brush painting, then contrasts it with memories of the brutalities of the war. Without ruining it, I cannot describe the final resolution of the novel, but to me it seemed absolutely in keeping with the mood of the narrative. I am recommending it to anyone who will appreciate the writing and the conjuring up of a time and place that few of us have direct experience of, but which gives the reader a feeling of absolute authenticity. I have a movie option! I know the siren song of the movies. I've had about five options on my novels, and all of them fell apart. For three days, Madonna wanted to make INTO THIN AIR her directorial debut, and then she went off on tour. I had LIVING OTHER LIVES about to go into principal photography, with a script written by an Obie-winning writer, when the director vanished. I almost had a deal for Pictures of You, but then the actress interested went off to do a studio-funded film. I started writing my own scripts, and I got into the first round of the prestigious Sundance Screenwriting Lab! They pick 12 next month, and though I am not holding my breath or crossing any fingers, it's still exciting. High Infidelity was a piece I wrote for Victoria Zackheim's anthology, THE OTHER WOMAN. About murderous shrinks and betrayal in love and friendship, it garnered a lot of attention, and got me on The Today Show twice! It's option by Wishbone Films, which tickles me, because I used to write Wishbone books, which includes Tracey Becker, whose Finding Neverland (with Johnny Depp) won an Oscar, Andrea Monier and Julie Eringer. I am so completely thrilled. I know it takes forever for films to be made--if they are made--but I also know that dreaming is a whole lot of fun. I knew and loved Abby Frucht's work before I knew and loved her. Fruit of the Month, Licorice, Are You Mine?, Life Before Death, Polly's Ghost--all are books that are dog-eared from rereading. Abby's won two National Endowment for the Arts Fellowships, A New Voice Award from Quality Paperback Club, and several citations for notable books from the New York Times. 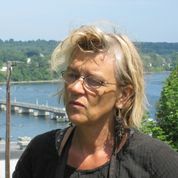 She also teaches in the MFA Writing Program at Vermont College of Fine Arts. I'm so jazzed to have Abby here on the blog today. 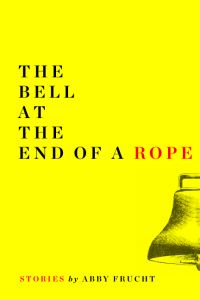 Her new collection The Bell at The End of a Rope is spectacular--and so is she. Thank you, Abby. What I loved so much about this collection was the strange, eerie quality, that reminded me of your novel Life Before Death. So I have to ask about your world view. Have you always seen the weird side of life? My friend Kathleen, who I love FOR her strangeness, rated me a 1. I next asked my son Jess, whom I admire for his groundedness, his reasoned forthrightness, and his ability to tell me roughly how much money my ex husband has made in the stock market. He rated me a 4, citing what he called my intelligence and my “unfilteredness.” Because “Unfilteredness” is not a word he ordinarily uses, I assume it emerged from a conversation he had with his fiancée last week after I met her parents for the first time. When I asked my son Alex, who is unusual in several ineffable ways, he said promptly that I am a 3.8, but when I asked him to explain, he said, “I don’t know,” and, knowing him well enough to know that if I asked again, he would only grow impatient with our telephone call, I didn’t ask again, after which he promptly surprised me by asking when I was coming to visit. Finally I asked Chuck, with whom I have lived for twelve years. “You’re not strange,” he said. “What do mean I’m not strange?” I said. “Oh. Would you rather I said you were?” he said. I pretended I didn’t hear that question, and he didn’t ask it a second time. You’ve written both short stories and novels--is the process different for you? Do you prefer one of the other? Or since, these wonderful stories are all sort of linked thematically, does it feel like writing a longer piece of work? Aside from the stories all having something to do with childhood, the links didn’t make themselves known to me until just a few years ago when I began to compile them into a book, at which time I realized that my childhood neighborhood and many of my childhood friends, neighbors, babysitters, family members and pastimes were included in them. Once I realized that these links were present, I played them up a little in revision, not in hopes of creating a book of linked stories, since of course this book is not, but rather to bring myself, and my reader, nearer emotionally to the world out of which the stories emerged. They were written over a period of nearly twenty years, during which time I wrote three novels which have nothing to do with each other. I don’t have a preference as to writing novels or writing stories. It’s an equal opportunity struggle for me to write one or the other, and there is equal enjoyment.. What I DO enjoy struggling most over are the individual sentences, no matter of what they are a part. The collection is so unexpectedly funny even as it deals with really serious issues--the death of a spouse, for example. But I also love the language. In Choir practice, Emily signs her letter “your fateful friend,” which is actually more accurate than if she had used the word faithful. Have you always been attuned to the frisky possibility of language? The other day I asked Chuck if he could explain the meaning to me of a dream I had had the night before. I loved the dream and was scared by it but I didn’t have a clue what it meant. I told him that in the dream we were walking in a place that is like most of the places in the dreams I have been having lately, a place both inside and outside, a forested, verdant landscape studded with architectural elements like columns and archways and doorways guarded by rabbits. In this particular dream, Chuck and I were walking, and a beautiful but unfamiliar wild creature that in the dream was understood to be a lion kept leaping out at me and nibbling gently at my hand, and when I looked at my hand there was a large, gaping hole in it that went all the way through to the other side, but it didn’t hurt and there was no blood. Chuck said, That’s easy. You were dreaming about Ike. Ike was our dog who died a few months ago. He was a golden retriever. He looked like a lion, and I often used to say to him, “You’re a ly’in on the bed!” or “You’re a ly’in on the floor!” He made me and Chuck whole, but now that he’s gone there is a hole in us. When I used to cry, Ike always came up and sat near me. The foster dog we now have is at this moment entirely oblivious to my crying, and she is not a ly’in on the pillow. She is a foster dog on a pillow. This doesn’t mean that I won’t someday fall in love with her, Chuck says…and when I tell her I love her, she believes that I do, and at this point, that’s what matters. I want to ask about your publisher, Narrative Library, which is part of Narrative Magazine--which I love. Their tagline is “storytelling in the digital age.” So, I have to ask, what was the experience like and how did it differ from working with traditional publishers? Editorially, the experience I’ve been having with Narrative Library is every bit as good and as warm as the best of my editorial experiences with more conventional presses. The people at Narrative have been on top of everything and have taken me through five or six readings with three different people. They’re really in it for the labor of love aspect…and they would be the first to admit that they can offer comparatively little by way of conventional distribution and sales, which is something I’m happy enough to live with, given that I haven’t ever made a sales splash anyway. Since they’re in it for the love, and since I am too, I know that we won’t disappoint each other. My sister, Sylvia was just named a judge by the governor of New Mexico (The reason I didn’t ask her to rate my strangeness is because she’s in the middle of all that right now) and what’s obsessing me is precisely how I will make it to the swearing-in ceremony and still make the trip I was supposed to take with Chuck and his son and daughter-in-law before going to teach in Vermont this winter. I WILL manage, I’m sure, but I hate logistics and making travel arrangements and thus I tend to obsess over them. Other than that, physical exercise is always at the top of my list. As Alex might say, there are 3.8 of them but I don’t know what they are.